G 3rd Ma. Cav. Ist Lieut. ; comm. and must. Nov. 1, 1862; comm. 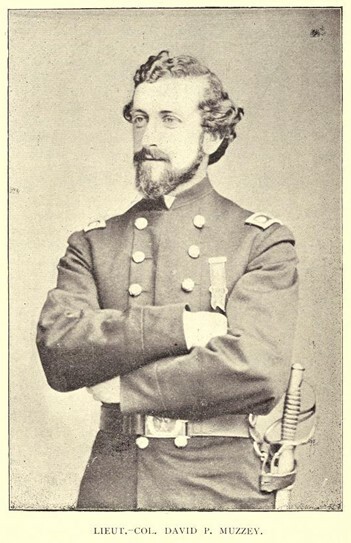 Captain June 17, 1863; must. Sept. 13, 1863; comm. Major Aug. 15, 1865; must. Sept. 1, 1865; comm. Lieut. Colonel, Oct. 5, 1865; not must. 3 MaCav Aug. 30, 1892 Invalid 1 128 105 1 082 087 Mass. Isaac Davis Post No. 138, Acton, Massachusetts (Sargent, Grand Army of the Republic: 426). Col. Muzzey resided in Stow and Littleton for a period after the war. Portrait above from Ewer: 80.